By pairing bone with porcelain, or entwining rusted nails with vines, Denman Island artist Cynthia Minden creates found-object “modern fetishes” from human-made materials and nature’s discards. 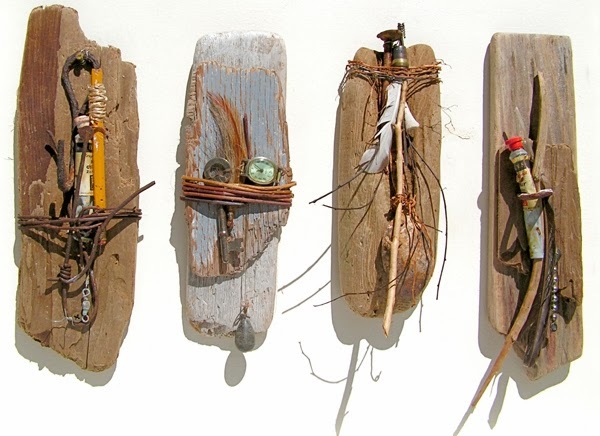 Her intricate mixed-media assemblages, currently on exhibit at Amelia Douglas Gallery, upturn assumptions about the value of objects, and quietly remind the viewer of the human impact on the ecosystem. Where do you find your objects for the assemblages? Cynthia Minden: I keep my eyes open all the time as you never know what might be just underfoot. “Seeing” is really important to me. I bring home everything that interests me and that I think I may be able to use. I may find things right outside my door, in the forest, along the foreshore, in a parking lot or a junk heap. Which types of materials are you most drawn to? CM: I particularly love rusty metal, with its sense of history and decay. Once considered useful, only to be discarded, the simplest object holds a story. Then, there's so much beauty in a torn leaf or curled piece of bark. I love discovering the possible association between found objects and natural materials. Do the values of the objects change during the process of turning them into art? CM: Yes, I am taking things that seemingly have little or no value and shining a light on them or pairing them with something else that I find curious in some way. By doing this, I hope to add value to these objects, making them precious in a way, so we are able to see them again. How does your background in weaving, basket making and other crafts inform your art? CM: As a basket maker, turning to sculptural form helped to develop my sense of spacial relationships, especially as I have made many groupings of figures that have a connection to one another. But I've also worked a lot with paper making, book binding and collage. The mixed-media assemblages evolved from all of this. Do you plan and diagram the works? CM: I don't tend to make diagrams but I do keep a notebook. Sometimes a piece seems to assemble itself; I may have a collection of items on my worktable and might suddenly see something magical happening if I put this with that, that with this. Other times, I struggle with paring away, keeping things simple, trying things in a variety of ways. It takes a long time. Reclamation: Mixed media assemblages by Cynthia Minden is on at Amelia Douglas Gallery, New Westminster campus, until Dec. 20. Gallery hours are Monday to Friday, 10am to 7:30pm, and Saturday, 11am to 4pm. Follow Amelia Douglas Gallery on Facebook and Twitter.